Here is the Voltron of all Bollywood Podcasts. Combining the powers of Beth from Bethlovesbollywood, Katherine from TotallyFilmi, Kara from Filmigirl and Bollyspice and a lone Asim sans his usual co-hosts, this bumper episode of Upodcast goes through the best and worst of 2010. No punches are held back and no performance is safe. we review the prominent releases of Bollywood give our take on Twitter Celebs, The Bikini issue and a look forward toÂ the rest of the year. Listen to this EPIC episode after the Jump! 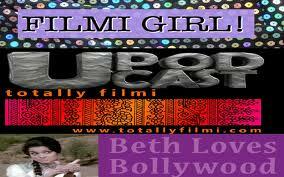 This episode will also be available on Totally Filmi in smaller downloadable files. Top 5’s of our favorite movies: We Review Raavan, Housefull, Kites, Raajneeti and many other releases of the first half of 2010! Special Shout out to our friends! The Curry Smugglers, Ghaati Mix Magicians! Our Bloggerfriend down under Vanessa from Shahrukhislove! And the Here is the link to the Veer Spoof by Sahil Riz! Let us know what you thought of the show in the comments section below!